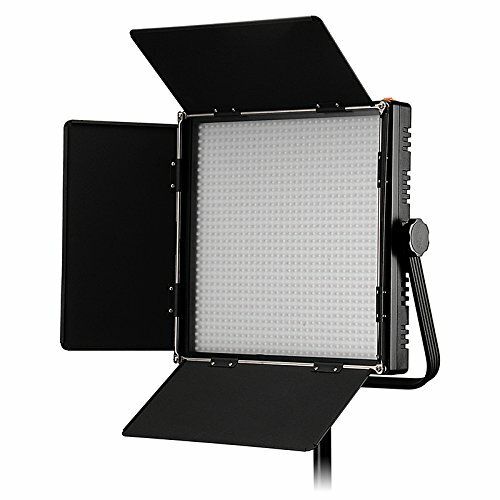 The Fotodiox Pro LED-1024ASL is a powerful and professional LED light panel, with over 1000 powerful LEDs. The 12'" x 12" 5600K light panel is versatile and powerful enough for studio shooting, all while remaining compact and lightweight enough to bring along on location. The 1024ASL is a complete kit that includes everything you need to mount this versatile LED light on a stand or hang in a studio scenario, and it all packs into the included premium custom case. The LED-1024ASL is equipped with with 512 ultra-bright 5600k LEDs and 512 ultra-bright 3200k LEDs. The powerful LEDs offer full spectrum, beautifully soft light - ideal for location and studio productions for both photographers and filmmakers. The light level is fully dimmable from 10%-100% to adjust the light output, either using the built in control knob or the backlit LCD status display touchscreen. A second control adjusts the color temperature of the 1024ASL, choose any value between 5600K daylight to 3200K tungsten. The rear-mounted backlit LCD touchscreen display shows the remaining battery level, the current brightness level, and the current color temperature. Control and shape the light with the included all-metal barndoors. The barndoors are permanently mounted for a secure fit, no matter how the light is positioned. An included diffusion panel can be slide and locked into place for softening the light source. All of this power and versatility is packed into a light panel only 2.75" thick, for industry-leading portability and reduced weight when mounting. The complete kit includes the 1024ASL light, all-metal mounting yoke, diffusion panel, AC adapter, diffusion panel and a custom-fitted molded case with handle.